Guaranteed best for quality and durability! Choice of glazed or solid rear door option – Both are fitted with stainless steel locks, hinges and strikers to ensure corrosion free durability. Painted white interior – Wipe clean and Jet washable. Offers a bright luminous finish and excellent light reflectivity. Built in roof carrying system – Twin horizontal supports carry up to 100kgs of pay load. Stainless Steel tie-hooks – Lash down loads with our stainless steel fitting points. Stainless Steel Hardware used throughout – Eliminate downtime by being the best in quality, fit and durability. Don’t suffer downtime and leaks fit PRO//TOP - Guaranteed best for quality and durability – Try one. You will not look back. A world leader has tested and approved this product, meaning the Pro//Top low roof tradesman is TUV complaint to standards of the EU. Also all glass and lights are E-marked for European use. Pro//Top low roof tradesman designed clamp system with neoprene seal employs a non drill, easy fit 6-point fitting making it easy to fit. 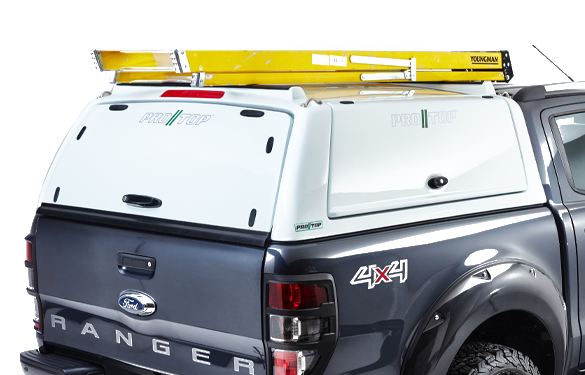 The Pro//Top low roof tradesman has a built in roof carrying system which can carry up to 100kgs in capacity. 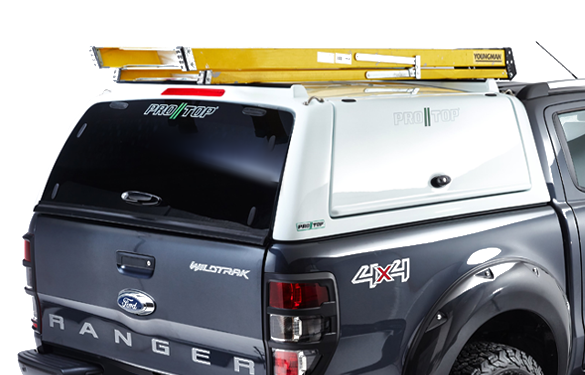 Pro//Top hard top canopies have the option of either a high security solid or a tinted glass rear door. This Pro//Top product comes with a three year warranty. Nice top. good quality and easy to install. Very impressed with the finish. Opted for the white standard colour. It actually looks good without been colour matched. Took me about 30-mins to install the canopy and maybe a further hour for the wiring. Roof system is good and looks very strong.